Inspired by a TEDx talk by one of the authors (see my post here), I've been rereading and studying this great book recently. I hadn't picked up on the concept of concinnity when I first read the book in 2008. Concinnity - "a skillful blending of the parts achieving an elegant harmony." 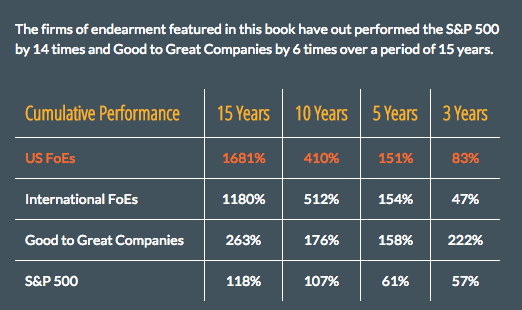 Unlike the organisations profiled in books like 'Good to Great' and 'In Search of Excellence' most of the companies that feature in 'Firms of Endearment' are still role models. These include BMW, Costco, Google, Harley-Davidson, Honda, IDEO, IKEA, Patagonia, Southwest Airlines, Timberland. I highly recommend this book. Check out the website. Below is a very interesting chart from the website. It's not about the numbers though right? As I say: Profit is not a reason for being in business, rather a result of being good at business. 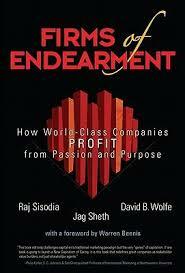 Today's greatest companies are fueled by passion and purpose, not cash. They earn large profits by helping all their stakeholders thrive: customers, investors, employees, partners, communities, and society. These rare, authentic firms of endearment act in powerfully positive ways that stakeholders recognize, value, admire, and even love. They make the world better by the way they do business-and the world responds. How could you do better in helping all your stakeholders to thrive? What's the one thing you'll do next? The slide opposite is by Scott McKain. I highly recommend his work on Distinction. Check out Scott's full slideshare here. 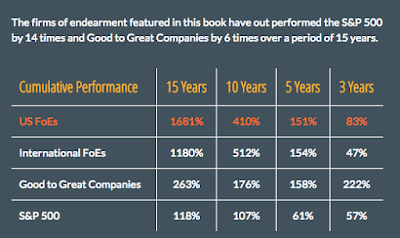 I also recommend this article by Todd Sattersten on the THE MIGHT AND MYTH OF GOOD TO GREAT. 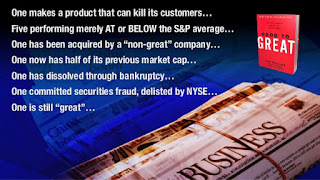 And the article GOOD TO GREAT… TO GONE! by Graeme Codrington. You can read it here.